What happens when one of my most favorite cookbooks is given a part two to accompany it? I go through many, many Post-it flags marking pages. I’ve been reading and marking pages in Plenty More and looking forward to various vegetables coming into season. I can’t wait for summer to try Dakos made with ripe tomatoes, Corn Slaw, and Eggplant with Black Garlic. After my first glance at this new book, I was worried that this was just the collection of dishes that weren’t quite good enough for the original Plenty. And, I still don’t think that first book can be surpassed, but the more time I spend with Plenty More the more I find to love about it. The Urad Dal with freshly grated coconut, the Polenta Chips with Avocado and Yogurt dipping sauce, and the Taleggio and Spinach Roulade are all competing for the top spot on my list of what to make next. Every dish combines flavors, textures, and colors that are hard to resist. 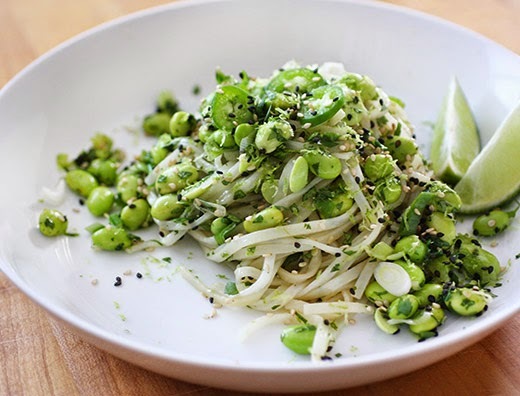 For spring, the Fava Bean Spread with Roasted Garlic Ricotta; the Sprout Salad Part Two with radishes, kohlrabi, carrot, and avocados; and the Rice Noodles with Green Onions and Edamame are bursting with bright, fresh tastes. 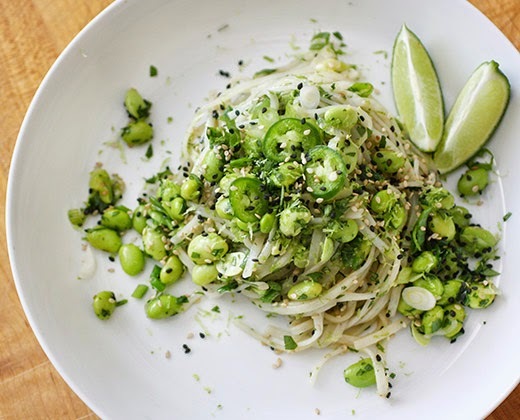 I can never turn away from a noodle salad especially one that’s this easy to make. I learned a trick from Dorie Greenspan for cooking rice noodles in advance and letting them stand until time to serve. You just rinse and drain them after cooking and then toss them with a little oil to prevent sticking. That same technique is employed here. The cooked, rinsed, drained, and oil-tossed noodles are set aside and covered to keep them warm. 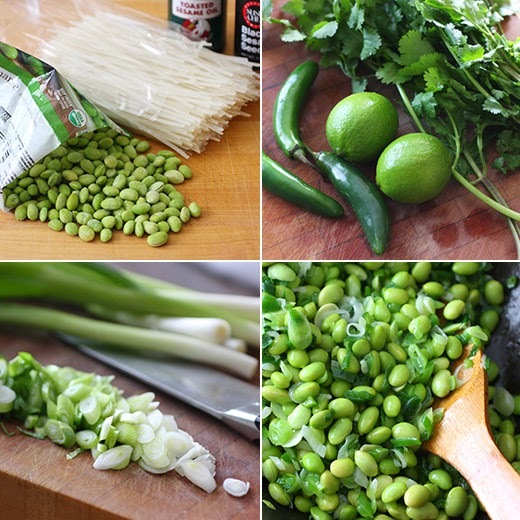 Next, sliced green onions and serranos were stir fried in a wok, and blanched, frozen edamame were added. The noodles were added to the wok along with sesame oil, black and white sesame seeds, rice vinegar, and chopped cilantro. The dish was served garnished with lime zest and more sesame seeds with lime wedges on the side. This was intended to be served warm from the wok which I did, but the cold leftovers from the refrigerator the next day were delicious too. The lime and chiles work their way through the few other ingredients to brighten the whole dish. This book is going on the shelf next its older sibling for now, but neither of them will be left sitting for long. There’s a lot to love about biscotti. You can go a very traditional route with them or veer off into all sorts of creative directions. For Christmas this past year, I got creative by baking big, mocha latte biscotti with chocolate chips in them that got drizzled with a white chocolate-espresso glaze. I’ve also made a peanut butter version and some that were fully dipped in chocolate. But, I’m also a big fan of the more proper, Italian almond cantucci that are subtly sweet, nutty, and all about the crunch. When visiting our friends who had just returned from a trip to Florence, they served us almond cantucci with Vin Santo for an after dinner treat. That combination proves that sometimes simple is most definitely better. And, the wonderful thing about Ciao Biscotti , the new book from Domenica Marchetti, is that it covers the full spectrum of biscotti making. I received a review copy of the book. The recipes begin with more traditional, nutty versions and one that even has Vin Santo in the dough. And, then there is a series of chocolate options including one that it is half lemon and half chocolate. There are dried fruit-filled flavors and suggestions for glazing and topping the cookies. Among the Fantasy Flavors, there’s even a Green Tea with White Chocolate Glaze. Next, you’ll find the chapter for The Savory Side. 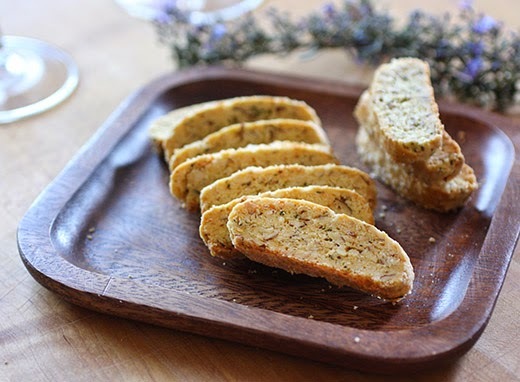 I’ve baked a lot of different kinds of biscotti, but I had never tried a savory one. I couldn’t wait. Mountain Gorgonzola with Walnuts, Pepper Jack and Green Peppercorn, and Sun-Dried Tomato and Fennel all sounded delicious, but I stopped everything to bake the Cornmeal with Rosemary and Parmigiano. The first few times I ever made biscotti, I had anxiety about cutting the slender cookies and how long to bake them for the second bake. I now realize that the issue was that I was following recipes that weren’t well-conceived. The instructions in this book are clear; there are clues for what to look for at each stage; and the baking times are specific for the type of biscotti being made. For these crunchy, savory cookies, you begin by combining flour, cornmeal, baking powder, and salt in the bowl of a mixer. I used a local, heirloom variety of cornmeal from Richardson Farms. The dry ingredients were mixed briefly to combine. Next, grated Parmigiano-Reggiano, sliced toasted almonds, and chopped rosemary were added and mixed. Small chunks of butter, beaten eggs, and milk were added last, and the dough was turned out onto a board. It was divided into two pieces that were each formed into a long loaf shape. The goal is to end up with small biscotti, so the dough loaves were stretched long and kept narrow. The dough was brushed with egg before it was baked at 350 degrees F for about 25 minutes. After the first bake, the loaves were left to cool for about 20 minutes before being cut into pieces. For this recipe, the cookies were cut to a thickness of about one-third inch. For the second bake, you can place the cookies cut-side-down and bake for 20 minutes, turn them over, and bake for another 20 minutes. Or, another tip I learned from Alice Medrich is to stand the biscotti on edge so both cut sides are exposed to the heat of the oven, and bake for the full 35 – 40 minutes rotating the baking sheet at the halfway point. If you want to check the crunchiness of the biscotti to decide if they should bake longer, you’ll need to remove one and let it cool before tasting. They get crunchier as they cool. The parmesan and rosemary smelled fantastic as the biscotti baked. I imagined several ways to use them like for dipping into a bowl of minestrone or topping a salad with them. But, the suggestion in the book for serving them with Chianti Classico was a perfect pre-dinner nibble with wine. I’m delighted to see the world of biscotti get a little bigger with the addition of a savory side. Recipe reprinted with publisher’s permission from Ciao Biscotti . 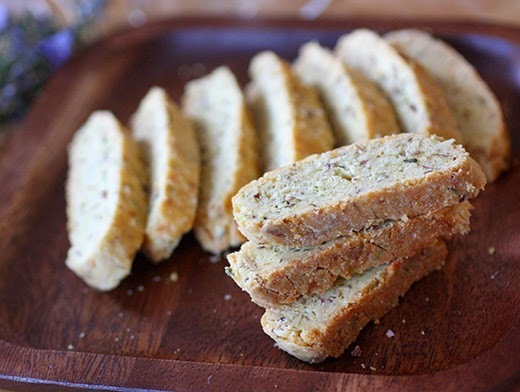 Fine-ground cornmeal adds a delicate crunch and pretty golden hue to these rosemary-infused biscotti. Slice these thinly and serve them with a nice runny cheese. Heat the oven to 350°F/180°C. Lightly coat an 11-by-17-in/28-by-43-cm rimmed baking sheet with the oil. Combine the flour, cornmeal, baking powder, and salt in the bowl of a stand mixer fitted with the paddle attachment. Mix briefly on low speed. 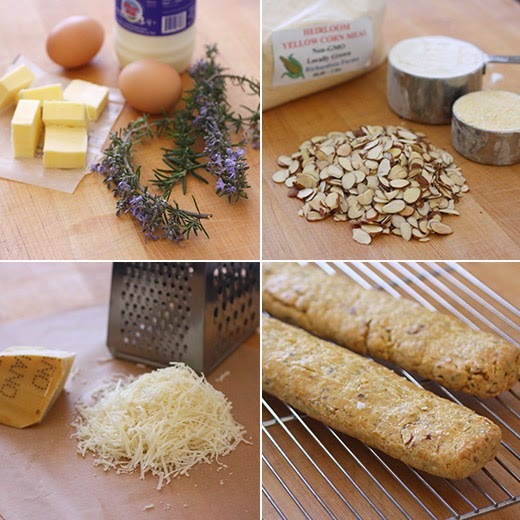 Add the cheese, almonds, and rosemary and mix to combine. Add the butter in pieces and mix on medium-low speed until the mixture looks like damp sand. Set aside 1 Tbsp of the beaten eggs. Combine the remaining eggs with 2 Tbsp half-and-half and pour into the mixing bowl. Mix on medium speed until a soft, slightly sticky dough has formed. Add the remaining half-and-half if necessary to make the dough come together. Turn the dough out onto a lightly floured work surface and pat it into a disk. Divide it in half. Lightly moisten your hands with water and gently roll one portion of dough into a rough oval. Place it lengthwise on one half of the baking sheet and use your hands and fingers to stretch and pat the dough into a log about 2 1/2 in/6 cm wide and 12 in/30 cm long. Shape the second piece of dough in the same way, moistening your hands as necessary. Press down on the logs to flatten them out a bit and make the tops even. Brush the reserved egg over the tops of the logs. Bake the logs for 25 to 30 minutes, or until they are lightly browned and just set—they should be springy to the touch and there should be cracks on the surface. Transfer the baking sheet to a cooling rack. Gently slide an offset spatula under each log to loosen it from the baking sheet. Let the logs cool for 5 minutes, and then transfer them to the rack and let cool for 20 minutes. Lower the oven temperature to 300°F/150°C. Transfer the cooled logs to a cutting board and, using a Santoku knife or a serrated bread knife, cut them on the diagonal into 1/3-in-/8-mm-thick slices. Arrange the slices, cut-side up, on the baking sheet (in batches if necessary) and bake for 20 minutes. Turn the slices over and bake for another 15 to 20 minutes, until they are crisp and golden. Transfer the slices to the rack to cool completely. The biscotti will keep for up to 10 days in an airtight container stored at room temperature. What to drink: Chianti Classico. How do you change the direction of 100 years of family cooking while honoring the traditions? That’s what Alice Randall and her daughter Caroline Randall Williams set out to do. They chronicled their family history and their desire to change their eating habits for the better in their new book Soul Food Love , and I received a review copy. The book begins with stories about three generations and five different kitchens and the types of cooking in each. The goal for mother and daughter was to keep the flavors from the past while fine-tuning approaches to arrive at healthy dishes for celebrations and every day. They’ve written of the historical complexity of the kitchen for many African-American families. “(The kitchen) has been a place of servitude and scarcity, and sometimes violence, as well as a place of solace, shelter, creativity, commerce, and communion.” When excess appeared in the kitchen, foods began causing illness rather than nourishing families. The authors want to change that pattern by offering dishes that are easy to make part of your home-cooking routine and are free of guilt. The Soups chapter begins with a few homemade broths, and one of them is Sweet Potato Broth. It’s a puree of cooked sweet potatoes in water with onion, celery, and carrot, and it sounds like a delicious base for lots of soups. It’s used in the Sweet Potato, Kale, and Black-Eyed Pea Soup and the Peanut Chicken Stew. There are several fresh and light salads like Savory Avocado Salad with Corn, Peppers, and Cilantro and New-School “Fruit” Salad with watermelon, cherry tomatoes, avocados, and feta. There are also updates to dishes made with practical ingredients like canned fish. The story behind the Salmon Croquettes with Dill Sauce brought back memories of the mackerel cakes my Mom used to make that I loved. Likewise, there’s a story about how eating sardines used to be thought of as a hardship, but now we know that they’re a healthy and sustainable choice. The recipes nicely weave together the best of the past with a health-conscious look forward. 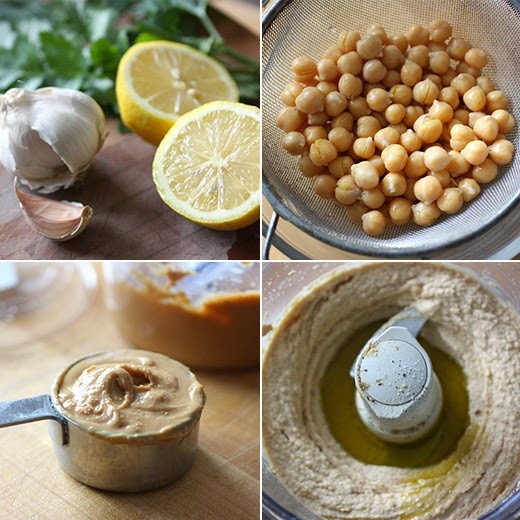 I was intrigued by the Southern Hummus recipe because as many times as I’ve made hummus, I’d never thought of using peanut butter in place of the tahini. Since I usually have some natural peanut butter on hand but not always tahini, this means I can make hummus even more often. It’s an easy puree in the food processor of natural peanut butter, lemon juice, and chopped fresh garlic. Next, rinsed and drained canned chickpeas, warm water, ground cumin, salt and pepper, and olive oil were added and pureed. I suspect there’s a typo in the book. The ingredient quantities seem to be meant for two cans of chickpeas. So, if using one can, the other ingredients should be reduced by half. 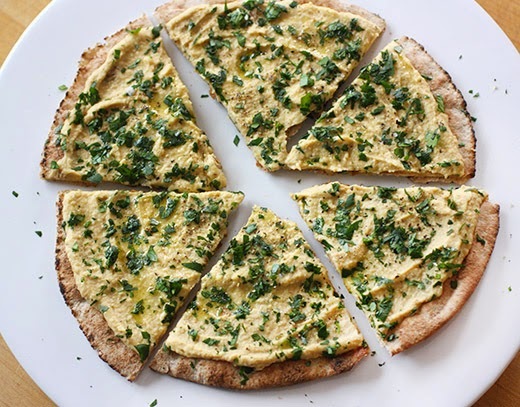 Later in the book, there’s a recipe for a Moorish Pizza which is pita topped with hummus, baba ghanoush, and chopped parsley. I couldn’t resist going that route with this hummus even though I didn't have any baba ghanoush on had. I warmed a fresh, whole wheat pita over the flame of a burner until toasted and crisp. 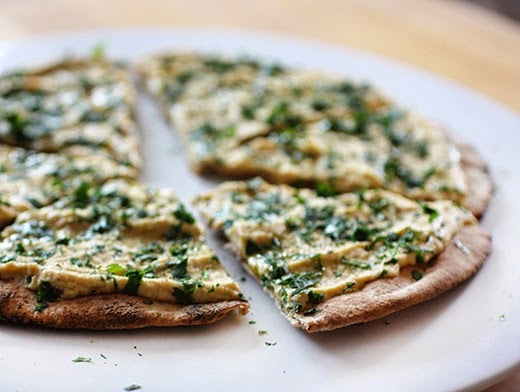 Then, I spread some hummus on top and sprinkled on chopped parsley. I gave it a drizzle of extra virgin olive oil, and cut it into wedges. This is going to be my new way of making hummus. I liked the flavor of the peanut butter in it even more than the usual flavor of tahini. And, the pita pizza made my day. It would be perfect with cocktails too. This book got me thinking about family food traditions and how to preserve them to make sure they’re not forgotten and update them as needed. I’m sure there are lots of dishes just waiting for a fresh take. Can cookbooks read minds? I’m pretty sure that’s what this new book from Molly Watson did. The book is Greens + Grains , and it is full of dishes made exactly the way I like to cook. When I started reading my review copy, I was sure this book was made just for me. There’s farro, quinoa, wild rice, spelt, barley, and polenta paired with chard, kale, arugula, beet greens, collards, and escarole. 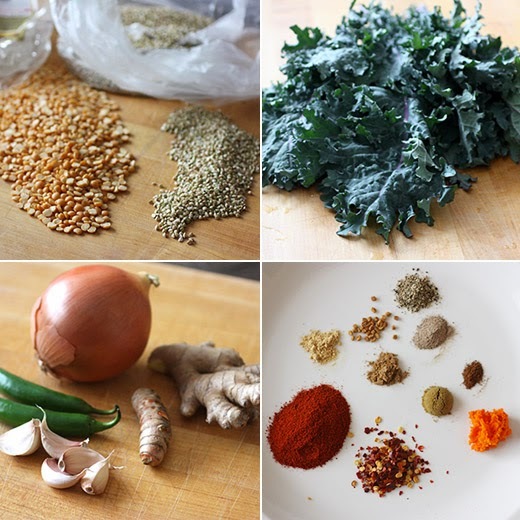 I mix and match those ingredients pretty regularly depending on which greens are in season. And, beyond those basic pairings, there are specifics about the recipes that are just what I’d want to do with the dishes too. For instance, the Corn Cilantro and Farro Salad with Chile Dressing is made spicy with jalapeno and is served on top of arugula leaves. The Wild Rice Salad with Kale, Pecans, and Blueberries nicely combines bitter, sweet, nutty, savory, and sweet. I’ve made similar salads with kale but never added blueberries. I can’t wait to try it. The Red Beans and Collard Greens with Brown Rice dish is spookily similar to something I make almost every week. Yes, I felt at home with this book. Although the style of cooking was very familiar, there were some new-to-me recipes too like the Fava Greens Quiche. I’ve never tried fava greens and now will have to find some or grow them myself. The Green Whole-Wheat Flatbread is like paratha made with pureed collard greens leaves mixed into the dough. And, I really have to make the grilled Collard Greens-Wrapped Feta. The first dish I cooked from the book was also something new to me since I’d never before used buckwheat groats. They cook surprisingly quickly, actually faster than the split peas, for Buttered Buckwheat with Fenugreek Kale and Spicy Yellow Split Peas. Because the split peas take the longest to cook, they should be started first. They were simmered with sliced ginger and turmeric. I used grated, fresh turmeric for this part of the recipe. Next, the kale was cleaned and chopped into ribbons. Butter was melted in a large saute pan, and ground fenugreek was added followed by minced onion, garlic, serrano chiles, grated ginger, and salt. After a couple of minutes, the kale ribbons were added and cooked until very tender. The buckwheat groats were cooked separately, and they only require about 15 minutes. The last element of the dish was the spiced butter. Butter was melted in a saucepan, and hot paprika, red chile flakes, ground cumin, ground cardamom, ground coriander, ground fenugreek seeds, black pepper, ground ginger, ground turmeric, allspice, and cinnamon were added. 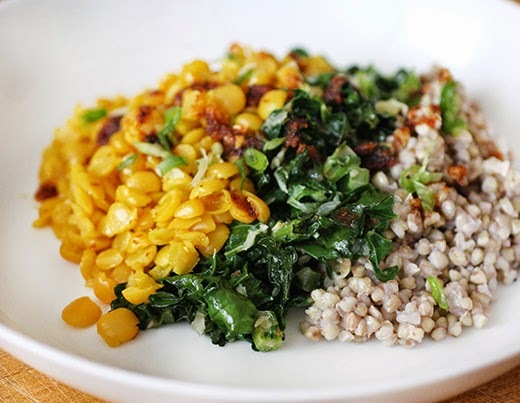 To serve, the buckwheat, kale and yellow split peas were plated next to each other and drizzled with the spiced butter. This was one of those times when I was uncertain what Kurt’s reaction to the meal would be considering I had gone full-vegetarian with it. I needn’t have worried. 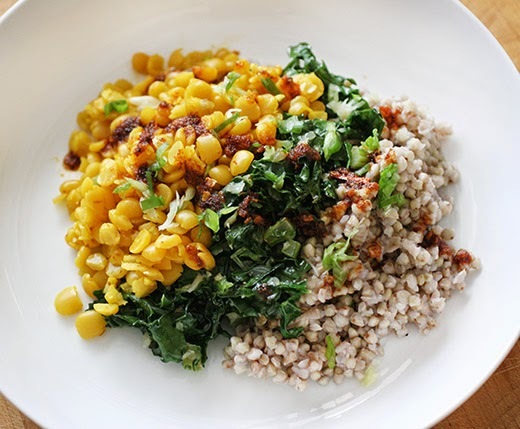 The serrranos and spices in the kale, the ginger and turmeric in the split peas, and that flavor-packed butter drizzle brought so much interest to the plate. The buckwheat was a chewy, mild backdrop for everything else happening with the dish. I like being on the same wavelength with a cookbook. I bet we’re going to spend a lot of time together. Recipe reprinted with publishes permission from Greens + Grains . Yes, this does seem like a lot of paprika. Don’t worry about that; the heat comes from the dried chile in the spiced butter. Feel free to use less of that, if you’d like. And yes, the spiced butter uses lots of different spices. While the spices do work together in a balanced and delicious way, you can feel free to use whatever combination you can cobble together. The key is the paprika; whatever else you can or can’t add to the mix, the spiced butter will still add plenty of pizzazz. TO MAKE THE SPLIT PEAS: Rinse the split peas and put them in a medium pot with 4 cups/960 ml water, the ginger, and turmeric. Bring to a boil, skim the surface of any foam, and simmer, partially covered, until the split peas are tender, about 30 minutes. Add more water, if needed, to keep from getting too thick or sticking to the bottom of the pot. Stir in the salt. Set aside. TO MAKE THE KALE: Trim off and discard the tough ends of the kale stems, chop the remaining stems and leaves all together; bite-size pieces are good, thin ribbons are even better. Melt the butter in a large sauté pan or wide, shallow pot over high heat. Add the fenugreek and cook, stirring as it sizzles, about 30 seconds. Add the onion, garlic, chiles, ginger, and salt. Cook, stirring frequently as the aromatics soften, about 2 minutes. Stir in the kale. Add 1/2 cup/120 ml water, cover, and turn the heat to medium-low. Cook, stirring now and again, until the kale is very tender, about 40 minutes. Remove the cover and continue cooking to let any excess water evaporate, about 5 minutes. Lightly sprinkle the kale with vinegar, if you like. Set aside. TO MAKE THE BUCKWHEAT: Bring 4 cups/960 ml water to a boil in a large saucepan. Add the buckwheat groats and salt. Cover, turn heat to low, and cook, maintaining a steady simmer, undisturbed, for 15 minutes. Remove from the heat and let sit for 5 minutes. Uncover and fluff with a fork. If the directions on the package for the buckwheat groats you have are much different from the ones here, follow the package directions; different varieties of buckwheat can cook up quite differently. Set aside. TO MAKE THE SPICED BUTTER: When everything else is ready to serve, melt the butter in a saucepan over medium heat. Add all the spices at once and cook, stirring until fragrant, about 30 seconds. Remove from the heat. Spoon the split peas, kale, and buckwheat alongside one another into six shallow pasta bowls. Drizzle the spiced butter over the split peas before serving. If some butter spills over to the kale and buckwheat, so be it.